The Sichuan Giant Panda Sanctuaries, located in southwest Sichuan province, are home to more than 30% of the world's highly endangered Giant Pandas and is among the most important sites for the captive breeding of these pandas. It covers 9245 km2 with seven nature reserves and nine scenic parks in the Qionglai and Jiajin Mountains. Along with the Giant Panda, the sanctuary is a refuge to other endangered species such as the red panda, the snow leopard, and the clouded leopard. Outside of the tropical rainforests, it is among the botanically richest sites of the world, and is home to between 5,000 and 6,000 species of flora. The giant panda is rarely seen in the wild, only 1500-2000 of them remain. So a panda safari is no option. The best alternative is to visit one of the 16 parks mentioned above to see their natural living environment, plus observe the animal itself in captivity. To achieve this, I went to Mount Qingcheng where 6 or 8 pandas reportedly still live and to the Panda Breeding Centre in Chengdu (not part of the WHS). The best combination probably can be found in Wolong, but I couldn't get there because the road was closed. This WHS highlights the habitat of the Giant Panda. This includes other animal species, like the similar elusive snow leopard, the golden monkey, black-necked crane, brown bear, red panda and golden eagle. Among the flora the high Rhododendron diversity (100 species) stands out. I spent half a day hiking around Qingcheng mountain (on what is called the 'back side' or 'rear mountain', the higher and more natural side of the mountain, instead of the front where most of the Taoist monasteries are located). The cable car ride up gives a good view of the tall trees in this mixed forest, and also the larger birds (I saw some black/white long tail feathered ones). 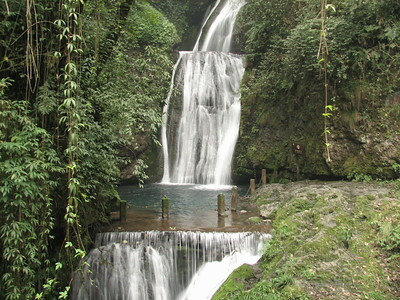 Hiking down through the lush forest I encountered several waterfalls, caves and a high diversity in low plants. Unesco has put the original Chinese nomination dossier on the internet (a good read), in which the giant panda is called "the single most admired and valued animal on the planet". In the breeding center in Chengdu I had a good look at some of them. They're cuddly for sure. And also unbelievably slow, they just fall asleep climbing up a tree. When they're not sleeping, they're eating - munching away kilos of bamboo a day. In August 2017, I made a day trip (organized by Sichuan Travel Guide; http://www.sichuantravelguide.com) from Chengdu to Gengda Wolong Panda Center, one of several areas created to protect giant pandas. The panda center was originally established in Wolong in June 1980, but a catastrophic earthquake devastated the region in May 2008. The center has since reopened a few miles from its original location. On my final day in Chengdu, I visited the Chengdu Research Base of Giant Panda Breeding, the global center for studying and breeding giant pandas. The center also researches the unfortunately named red panda, which is not closely related to the giant panda, but, by virtue of nomenclature, is destined to be the lesser panda (another of its names). The last World Heritage Site I saw during my one week trip in Chengdu was the famed Sichuan Panda Sanctuaries, home of pandas but also one of the most stunning landscapes in China. While most of tourists came to Chengdu to see Pandas in bleeding center, I had no interest to see this cute animal at all as I already saw them many of times in China, in Netherlands and in US. At first I planned to visit the listed area in Qingchengshan as Els did, but at the end I decided to take 2 days tour to Siguniang Mountains instead after saw its stunning travel brochure. Early morning from my hotel, a local guide with his car came and picked me up and then we drive directly to Siguniang Mountains. Then I noticed that the route did pass Dujiangyan which I visited yesterday and the famed city of Wolong where Panda Center located. In the afternoon, the view of mountain range was more and more beautiful while the road became more and more hairpin, I had to told driver to stop many times to take stunning photos. At last I was arrived the villages of Changping and Rilong which were the gate of Siguniang in the evening, the view of mountain was incredible and impressive like Canadian Rocky Mountains plus the Dolomite and Grand Teton Range! The color of grassland in the valley were changing by the sunset with small Tibetan pagoda on the top of the hill, I felt I was in Shangri-la. The villages were also amazing with Tibetan architecture, but these buildings were actually new and built to replace old villages after earthquake. In the next morning, I entered the Siguniang; the entry fee including transportation was 90 RMB, very cheap compared to other World Heritage Site. I had to use park minivan as private vehicle was not allowed. Inside the park was full of pine forest and lovely lakes. While I was at one Tibetan Temple inside the park, my guide told me the legend of a giant wanted to marry four daughters of a village chief, so the giant killed their father and attacked the village. Four daughters ran away into the forest to hide from giant, with god help, they were covered with ice and snow and transformed to mountain ranges called Siguniangshan which means mountain of four ladies. There also was a wishing lake that could grant wishes if put hand into the very cold water and pray! After lunch time, I started my journey back to Chengdu. The whole trip did remind me the US road trip I had earlier in the same year without modern tourist facilities; for example, western style toilet and proper gas station! But it was a great trip and worthwhile to see stunning landscape. The closest comparison maybe the Three Parallel Rivers in Yunnan, these two sites had many similarities with stunning snowcapped mountain range and Tibetan culture, but from my experience, Siguniang seemed to be more untouched than the one in Yunnan, but this possibly was a result of devastated earthquake which destroyed many villages and turned the area to be unpopulated. By the way, without panda, Sichuan Panda Sanctuaries especially Siguniang Mountains is already a great sight to see and another impressive natural world heritage site of China. Visited Bifeng Gorge in Ya'an, Sichuan December 29th. About two hours away southwest of Chengdu. Originally, there was a plan to visit Wolong and/or Siguniangshan; but we were advised not to risk going to the earthquake-struck area. It was unclear whether the roads are passable; if the scenic parks were open, etc. It is hopeful that Wolong and Siguniangshan will operate again this year. 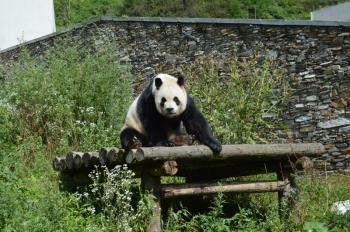 Since May 2008, most of the pandas were moved to other (safer) locations: Bifeng Gorge has about 30. If you wish to see just the pandas, you can visit either Bifeng Gorge or the Breeding Center in Chengdu. For those seeking scenic views of West Sichuan, we can wait for updates on when Wolong and SGNshan will open again. I thought the Sichuan Giant Panda Sanctuary was AMAZING. All the pandas were absolutly beautiful. I would recomend the sanctuary for any age, young or old. This is a perfct place for photos. A great day out with the family! Tibetan Buddhism: Wolong and Siguniang Mountain areas have many Tibetan communities and temples. Early Pleistocene: The first discovered skull of the animal, in south China, is estimated to be 2 million years old.